SILVER SPRING, Md. --- A Christmas Day email blast from the General Conference headquarters of the Adventist Church has instructed world divisions to demand that members refrain from telling their children about Santa Claus. 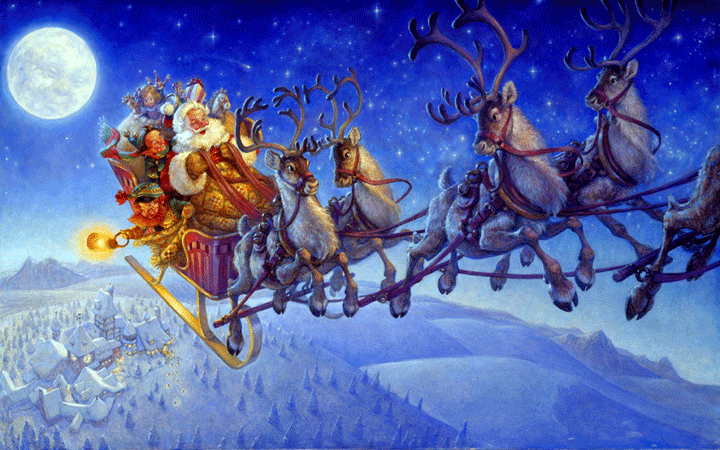 The reason for the Santa ban was explained as "multiple descriptions of this intemperate character levitating in a sleigh." GC Director of Creative Overreaction Bahum Bugh said that the fact that Santa levitates and flies through air is "a complete violation of the laws of nature and can therefore only be interpreted as a sinister ploy to deceive the faithful." To back up his claim that there could be no physical explanation for Santa's leaving the ground, Bugh pointed to several annotated Christmas cards that had been attached to the GC email. "There is no way those little reindeer could gain enough speed to launch a man of that size into the air," said Bugh, "especially if he is supposed to be carrying presents." Yes, Virginia, there is No Santa Claus. Claus is a made up figure from Madison Ave. hype types to bring you into WalMart, Costco, Sears, JC Penny, Sam Club, etc. Santa’s not gonna check to see if you is naughty & nice. Too many people in the world presently. Even if he used a computer, it would take way too long. Listen to Mommy & Daddy. They know best. Then listen to your SS teacher, your classroom teacher and finally to your Pastor. Send me a big box of Little Debbies for Christmas. This is not the origin of Santa Claus… and why would the gc get a long one up their butts about breaking laws of nature? I thought jesus was supposed to have walked on water and such..